Constable Andrea Heath became the first woman to return to work on a part-time basis in 1993 after taking time off to have her first child. Prior to that women had to either resign or return full-time after having a child. When she left to have her first baby in 1991 she resigned and told her Inspector that if the policy ever changed she’d like to come back. So when she got the call from Inspector Jack Johnston two years later she jumped at the chance. “It was really transformational. Suddenly women had options that we ne1ver had before. “We could take a break for children and then continue to pursue our careers,” she said. She came back to work for two shifts a week, first for a trial in community policing and then on the Hobart Watch. It soon became the norm for women to return after maternity leave, and Andrea left and returned again after her second child. “We were so pleased to work flexible hours, balancing our career with the needs of a young family. “The initiative was very well received by our peers. Not only were they supportive but they appreciated the fact experienced officers were returning to duty to work alongside them,” she said. Now there are 88 female police officers working part-time. 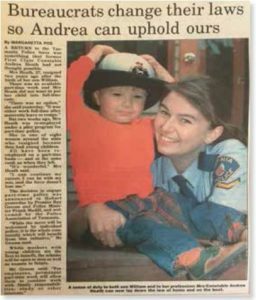 Right: Constable Andrea Heath and son Edward in 1993 (courtesy of The Mercury Newspaper, Hobart). This page -- https://www.police.tas.gov.au/about-us/100-years-women-policing-tasmania-police/agents-of-change/paving-way-part-time-working/ -- was last published on January 17, 2018 by the Department of Police, Fire and Emergency Management.